From Bruce: Glad I'm still around but suprised so many are not. I have been living in Burnsville during the past 40 years with a part time residence in Florida for the past 14. I've been married for 45 years and have acquired a couple of grand kids. Definitely looking forward to being at the reunion. From Anita: Still working but enjoy spending as much time as I can with three Grandchildren. Spend part of the year in the Midwest. Family home in SLP sold last year so I have a home in Wisconsin. I always say I have lived in California temporarily for 48 years. I enjoy reading, cooking and fishing so the peaceful Midwest is where I gravitate to. Concert band was a favorite class but I haven't played the saxophone since graduation. From Nancy: Bob and I live in NJ and have been married for 35 years. We have been blessed with 3 great kids-Bobby 31, Eric 29 and Erin 27 and two precious granddaughters. I have been fortunate to have had a job that I have absolutely loved for the past 35 years. I work with some school aged children, but primarily with preschoolers with developmental delays. It's always a great day at school with alot of talking, playing and laughing with the bonus of hugs. I have been on the faculty of the History Department at Boston University since 1990 and also currently hold the position of Director of the American Studies Program (a legacy, in part, of the good fortune of having had Marge Bingham for English my junior year where I first learned from her, a doctoral candidate in the subject herself at the time, that there even was such a thing as the academic field of American Studies). I specialize in the areas of immigration, race and ethnicity with particular interest in immigrants of African descent as well as the relationship of ethnic identity and consumer culture and have written several books and many articles on these topics. My current book project is a study of recent West African immigrants and refugees to the United States. I live at the shore on Buzzards Bay (in Fairhaven, Massachusetts) with my husband, Jonathan, and we have three great kids and an adorable grandson. Unfortunately, I won’t be able to attend the reunion but I hope all those participating have a wonderful time and thanks very much to the organizers for putting together both the event and this website. From Tim: I've worked for a metals distribution company for 28 years, it pays the bills. My life revolves around my 2 boys, Jim and Anthony, photography and my continuing life with the Vince Shute Wildlife Sanctuary. The sanctuary involves wild black bears and our main objective is the education of black bears to the public. I am currently on the Board of Directors and am the Chairman of the Board. It's all alot of hard work but I enjoy it very much. We have been in existance since 1995. Come join us at www.americanbear.org. Check us out!!! I also enjoy photography very much and wildlife is my passion. Took my fantasy trip to Africa this past winter, got lots of great photos and hope to go back again. Will see you in 5 years. 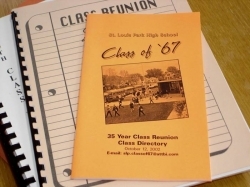 From Joanne: I remember my Dad going to his 50th high school reunion in New Effington, SD, and my trying to figure out how it would feel to be that many years out of high school. Surprise!! See you at our 50th in August. From James(Jim): Brenda (Parker) and I have been happily married for 38 years this year. She followed me around for a 31 year Navy Career. I retired from the Navy in 1998 as a Master Chief. Now employed by the Veterans Administration, Ft Snelling. We have 2 wonderful children who live in the cities and 4 wonderful grand children. Life has been exceptionally good to me and my wonderful family. From Ilse: After high school I graduated from the U of M, traveled in Europe, attended graduate school in Albuquerque, NM, attended graduate library school in Austin, TX,, and married a professor from India. During the next 25 years we visited India, lived and worked in the Middle East, Virginia, Tennessee, and Texas, and raised one son, who completed graduate school at MIT and is now an investment fund manager. I have one delightful grandson. Although I enjoyed working as a book reviewer and an academic librarian, I now enjoy not working even more! Fifteen years ago I remarried. My second husband Brad and I (see photo) live on ten wooded acres near Olympia, Washington in a small, energy-efficient house which we built by ourselves. In our free time we like to swim, bicycle, hike, enjoy the natural, wild places in the Pacific Northwest, and visit family in Boston and St. Paul. From Karyn: I worked as a legal secretary upon graduation, switched to technology companies, and worked in San Francisco, Boston, Los Angeles, and finally back home to Minneapois where I met my husband of 43 years, Rich. We have three children, two boys and a girl, and one granddaughter. Rich graduated from DeLasalle (1961), and has worked in real estate and tax preparation in the Twin Cities, and is still working! We spend most of the winter in Sun City, Arizona. I would welcome visitors when Rich returns to Minneapolis to do taxes, and I am in Sun City. Give me a call at 952-212-1526. From David: Married to Nannette Nystrom (Robbinsdale 67). Long time employee of General Office Products Company not that far from the old stomping grounds of the St. Louis Park High School. Moved a little west to Deephaven and raised two children who now have kids of their own. Our son has two boys, the oldest being 4 and our daughter has two little girls and her oldest is 2. Since both families live in the Twin Cities area we don't have to travel great distances to see them. My wife managed to talk our son into going to her college alma mater, St. Olaf College and our daughter had a great experience at Luther College. From Mark: Brief college experience at the University of Minnesota>Marine Corps Vietnam, Sobriety, back to college. Career in technology and leasing owning a business and working for big business. Minnesota state power lifting championship 1990. Ten years Florida semi retire in 2000. Relocation to Chicago. Back to school at Morton Arboretum turning into full time employment as the Natural Resources Supervisor restoring and managing 972 acres of woodland,wetland and Prairie. Still a gear head, 2016 Shelby GT350 in the garage. Hope to make the reunion. It’s hard to believe it’s been 40 years since we graduated, time moves so fast. I was surprised to see a picture of Karen and me from the 10 year reunion, where we won the prize for the most recently married graduate. I had so much hair and so few wrinkles! Thirty years later we’re still very happily married, living in Chicago and enjoying life more than ever. Three years ago I retired after a 35 year career in broadcasting and now spend my time building custom furniture which I sell through galleries in and around Chicago. Karen and I get plenty of exercise exploring the country side by bicycle and have ridden nearly 30 thousand miles in the last 10 years. From Barbara: I have lived in Golden Valley my whole married life. Earl and I just had our 45th anniversary. We have 2 children, a daughter and a son. We have 5 grandchildren- 4 girls and a boy. We are very fortunate that everyone lives in town now. I taught nursery school for 17 years and have been retired for about 10 years. Earl retired 3 years ago, and we have been doing a lot of traveling by ourselves as well as with all our children.